Triple Crown Growth should be fed to growing horses along with free access to good quality pasture and/or hay, fresh clean water and plenty of free exercise. For nursing foals, feed 1% of body weight up to 400 lbs. For weanlings and older, the amount of Triple Crown Growth fed daily should be adjusted to maintain a moderate body condition level. If not sure how much to feed, begin with 6 - 8 pounds per day divided into as many feedings as feasible and then adjust up or down depending upon the needs of the individual horse. 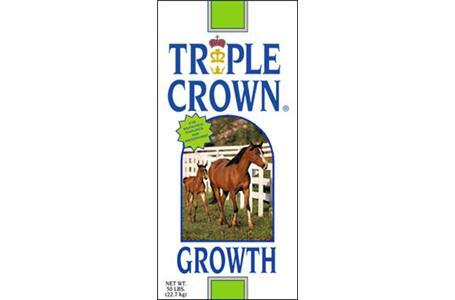 If feeding less than 5 pounds of Triple Crown Growth on a regular basis due to easy maintenance of desired body condition then 1/2 to 1 pound per day of Triple Crown 30 Supplement should also be fed in combination with Triple Crown Growth as means to insure adequate mineral and vitamin intakes to support sound growth. For Ponies, feed half of the recommendations listed above for horses. NOTE: Provide plenty of fresh, clean water and forage at all times. Keep product fresh in cool, dry storage. Examine product daily for mold or insect contamination. DO NOT use product that is old, molded or insect contaminated.